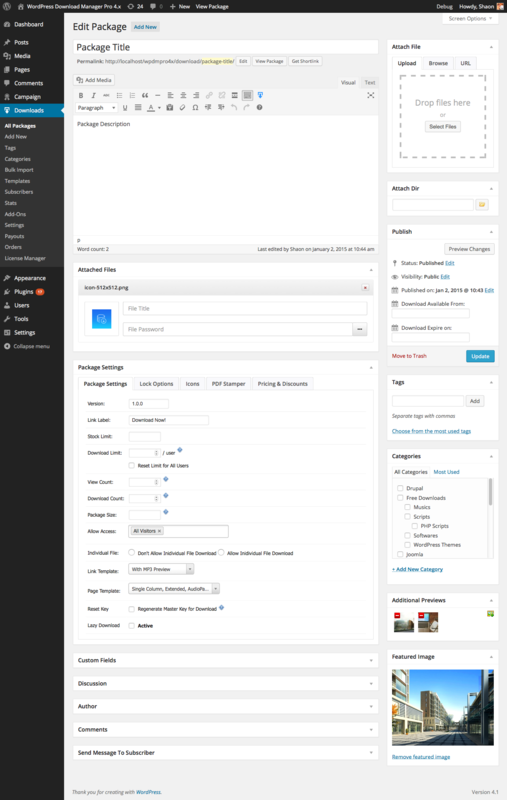 Step 1: Go to your WordPress admin panel dashboard. Step 2: Go to Downloads -> Add New from you admin dashboard. A new “Add New Package” page will be displayed. This is the title section for your downloadable package. Enter a meaningful title for you package. This is the description / details section for your package. Here you have to write detailed description of your package. Select category for package. The Package will be listed under all selected category when you will use category embed code. If you want to tag your package, you can use this section. This section works exactly native WordPress tag feature. Here you can select featured image for you package. Short code for the featured image is [thumb]. After fill out all necessary data as per your requirement, click “Publish” Button to publish your package.